2016 was a great year for social media marketers. Brands large and small from around the world created superb campaigns that delighted audiences with their storytelling, broke new technical ground, and inspired widespread action. Given this flood of high-quality content, and the subjective nature of taste, picking the best campaigns of the year is a bit of a fool’s errand. Still, we’ve given it a shot. Below are 10 of our personal favorites from 2016. We’ve chosen these particular offerings not only because of how well they were executed, but also because we believe marketers can learn valuable lessons from each. What: To highlight its involvement in auditing and protecting the 2016 Academy Award voting, accounting firm PwC gave the Ballot Briefcase its own Snapchat account. The social-savvy bag then traveled around the country, arriving just in time for the Oscars ceremony after having a host of adventures. Why It’s Great: Many brands still struggle with what to do with Snapchat. 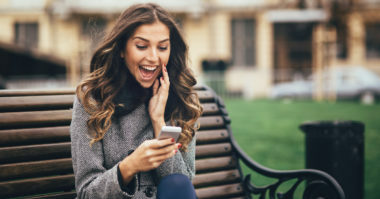 The #BallotBriefcase campaign shows that with a little imagination, every type of business can find a way to successfully connect on the platform. What: This YouTube video campaign from foodmaker Knorr was simple and brilliant: single adults were asked to describe their favorite flavors and were then set up on dinner dates based on common tastes. The catch? Each pair of matched strangers had to feed each other the prepared meal. Why It’s Great: The #LoveAtFirstTaste video is less than three minutes long, yet it’s chock full of drama. The audience is immediately engaged by the blind date premise, then sticks around to see what happens when the people try to feed each other. It shows that any brand video can be captivating with the right premise and execution. 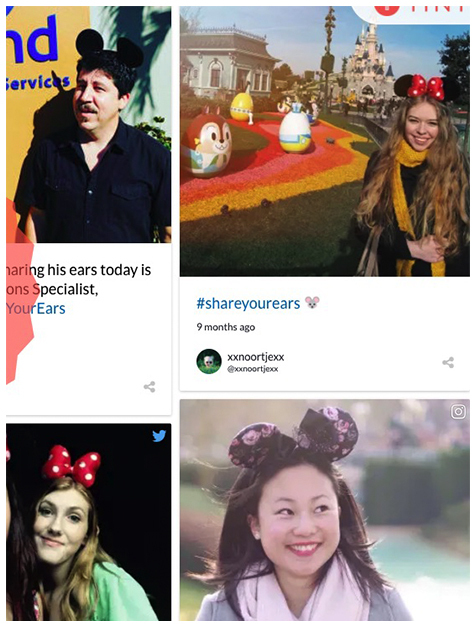 What: For every post made to Twitter or Instagram using the #ShareYourEars hashtag, Walt Disney Parks and Resorts made a $5 contribution to the Make-a-Wish Foundation. The campaign ultimately resulted in $2 million in donations to the charity. Why It’s Great: Sometimes the best social campaigns are the simplest. By combining an easy premise—people just needed to post using a single hashtag—with a well-deserving cause, Disney was able to help its brand while also helping others. What: This Tumblr and Vine campaign (RIP Vine) from GE asked a simple question: how much science can you fit into six seconds? The resulting #6SecondScienceFair user-generated videos—which GE highlighted and promoted—were smart, easy to share, and captivating. Why It’s Great: This offering from GE had all the elements of a successful user-generated content campaign: a good premise, a simple way to engage, and a good structure for highlighting the best pieces. What: To honor the Muslim holy month of Ramadan, Western Union teamed up with an individual, Nubaid, to do one small act of generosity each day. Each action was highlighted on multiple social networks, including Facebook, Twitter, and YouTube. Why It’s Great: The #30daysofbetter campaign involved a small investment by Western Union and had a huge impact. It sparked a constant stream of content throughout the month of Ramadan and garnered much goodwill from the company’s global audience. What: Giving is fundamental to the identity of TOMS: the company donates a pair of shoes to an impoverished child for every pair it sells. Each year it takes this one step further by asking people to post photos of their bare feet on social media using the hashtag #OneDayWithoutShoes. The company then donates an additional pair for every post. Why It’s Great: TOMS has built a successful annual social media event by combining a good premise, a good cause, and consistency. 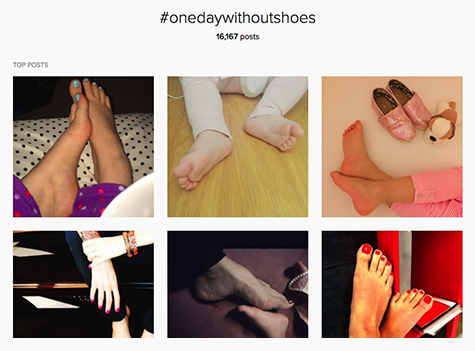 By holding #OneDayWithoutShoes every year, it builds on its past successes rather than starting from scratch. What: For the 2016 Summer Olympics, yogurt maker Chobani had its sponsored athletes post to social media using the simple hashtag #NoBadStuff. Participants included soccer player Alex Morgan, who was featured in a YouTube video, and wrestler Jordan Burroughs, who posted the photo below to Instagram. Why It’s Great: What made this campaign shine was its light branding and great hashtag. The Chobani name was barely mentioned in most of the posts, but the #NoBadStuff message came through loud and clear for both the athletes and the product. What: Footwear maker Adidas found a way to tap into the social power of messaging and texting by creating Tango Squads, which are hyper-local groups of devoted football (soccer) fans. By joining the groups, members get access to exclusive offers, content, and events. Why It’s Great: Social engagement increasingly is occurring in closed groups and one-to-one messaging, especially for younger consumers. The Adidas campaign shows that this trend doesn’t preclude brands from still effectively reaching audiences. 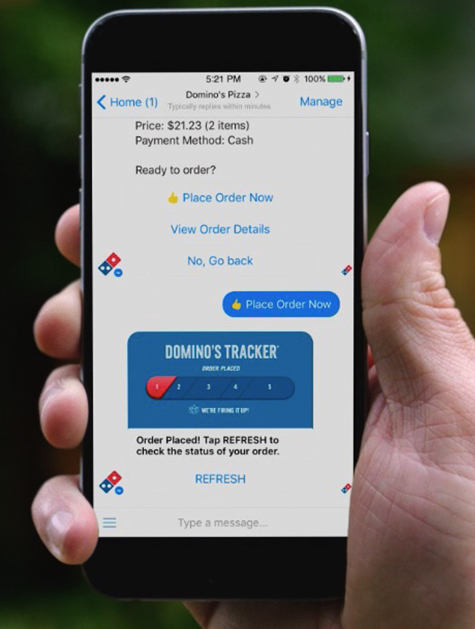 What: Over the summer, Domino’s introduced a Facebook Messenger bot in the UK, and this fall it made its way to the US. Simply set up an account and then message the @Dominos account to order and track your food. Why It’s Great: Social media marketing doesn’t have to be purely promotional, nor does it have to always occur on established channels. The Domino’s Facebook Messenger bot shows that campaigns can mix branding with utility, and that they can take place on still-evolving platforms. What: This short YouTube holiday film from the retailer was directed by Wes Anderson and trended worldwide. It tells a heartwarming holiday story in the quirky, distinct style of the renowned director. Why It’s Great: The best pieces of social content are successful because they make audiences think, feel original, inspire emotion, and leave a lasting impression. This little video certainly does all of that perfectly. Implement a dynamic social media marketing campaign for your brand. Contact MDG Advertising today at 561-338-7797 or visit mdgadvertising.com.